We are developing various stem cell-based models to better understand the phenotypic consequences of common genetic variants. Comprehensive Protocols for CRISPR/Cas9-based Gene Editing in Human Pluripotent Stem Cells. Santos DP, Kiskinis E, Eggan K, Merkle FT.
Curr Protoc Stem Cell Biol. 2016 Aug 17;38:5B.6.1-5B.6.60. doi: 10.1002/cpsc.15. PubMed PMID: 27532820; PubMed Central PMCID: PMC4988528. Paull D, Sevilla A, Zhou H, Hahn AK, Kim H, Napolitano C, Tsankov A, Shang L, Krumholz K, Jagadeesan P, Woodard CM, Sun B, Vilboux T, Zimmer M, Forero E, Moroziewicz DN, Martinez H, Malicdan MC, Weiss KA, Vensand LB, Dusenberry CR, Polus H, Sy KT, Kahler DJ, Gahl WA, Solomon SL, Chang S, Meissner A, Eggan K, Noggle SA. Nat Methods. 2015 Sep;12(9):885-92. doi: 10.1038/nmeth.3507. PubMed PMID: 26237226. Focus on induced pluripotency and cellular reprogramming. Schwarz-Romond T, Kiskinis E, Eggan K.
EMBO J. 2015 Jun 3;34(11):1435. doi:10.15252/embj.201591615. 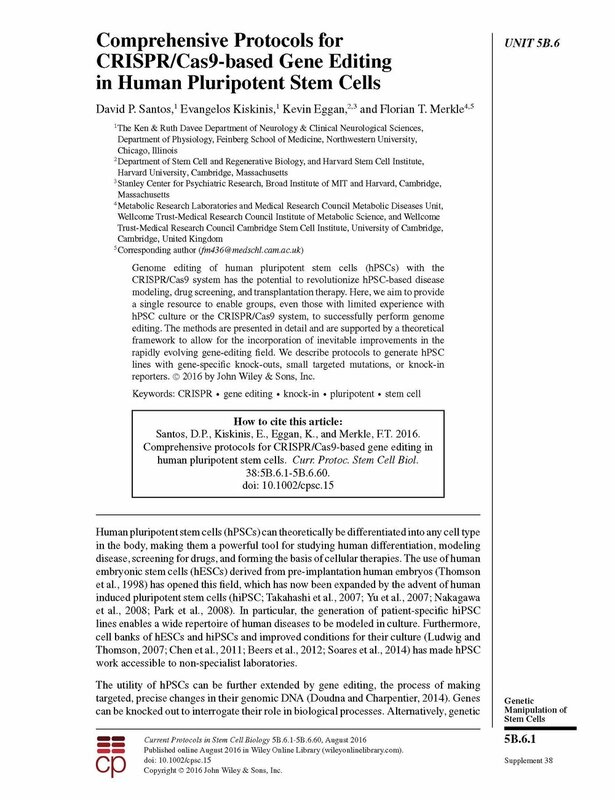 PubMed PMID: 25916828; PubMed Central PMCID: PMC4474519. Efficient CRISPR-Cas9-mediated generation of knockin human pluripotent stem cells lacking undesired mutations at the targeted locus. Merkle FT, Neuhausser WM, Santos D, Valen E, Gagnon JA, Maas K, Sandoe J, Schier AF, Eggan K.
Cell Rep. 2015 May 12;11(6):875-83. doi: 10.1016/j.celrep.2015.04.007. PubMed PMID: 25937281. DNA methylation dynamics of the human preimplantation embryo. Smith ZD, Chan MM, Humm KC, Karnik R, Mekhoubad S, Regev A, Eggan K, Meissner A. Nature. 2014 Jul 31;511(7511):611-5. doi: 10.1038/nature13581. PubMed PMID: 25079558; PubMed Central PMCID: PMC4178976.